Nine horses went into the quarantine facilities at Newmarket or Tipperary before eight of them board a flight to Melbourne due to touch down at Tullamarine on October 13. 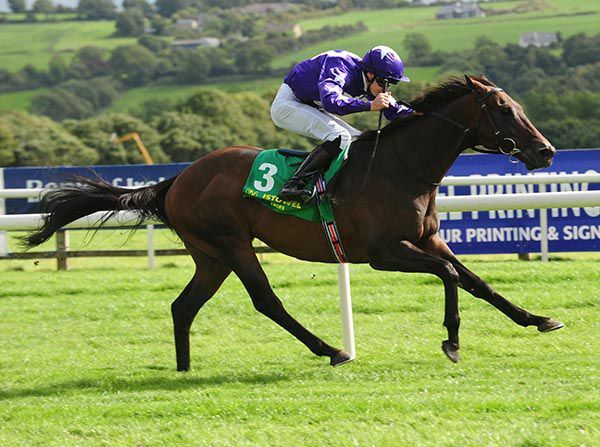 Master Of Reality has the lowest international rating and the Joseph O'Brien-trained gelding, who is a stablemate to Melbourne Cup hopeful Latrobe, will only make the flight should one of the other eight not travel due to space restrictions caused by the record number of spring challengers this year. Williams said it seemed unlikely there would be room on a plane or in quarantine for Master Of Reality and if that’s the case he won’t be coming. “Hopefully Latrobe can come to Melbourne but at the moment there doesn’t seem there is room on the plane and in quarantine for his partner Master of Reality – without his partner he can’t travel,” Williams said. Trainer Joseph O'Brien registered a 1-3 in the Dandy Man Maiden at Fairyhouse today as his winner Dramatise caused a 50/1 upset on debut under Seamie Heffernan. O'Brien's better fancied runner and eventual third King's Field (11/2f) was an unlucky loser in the race having met significant trouble in-running along the inside running rail in the home straight but winner Dramatise herself had to overcome a wide draw in 15, in scoring her length and a half success over Encantador. Trainer Joseph O'Brien later said “to be honest I was surprised. She was working nicely at home but we thought she'd be a bit green to win first time out. “She's obviously a nice filly and we'll step her into black-type company now. She was very impressive in fairness to her. “She's just a big filly and has taken a little bit of time. She's a fine, big, good-looking filly with a good pedigree. Champion Jockey-elect Donnacha O’Brien moved to the 99 winner mark for the season at Gowran today when completing a treble on his brother, trainer Joseph O'Brien's Best Not Argue, which landed the Jumps Racing Returns October 5th Handicap (div 1). 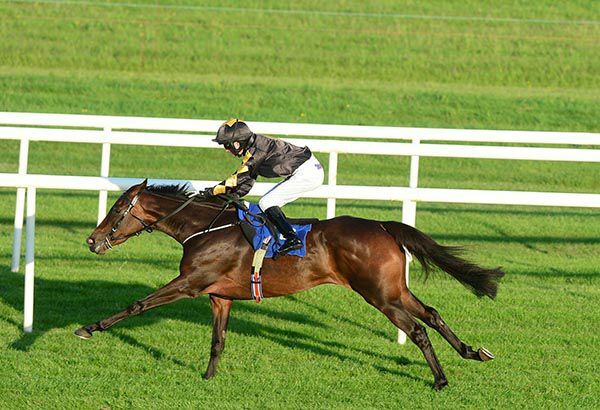 The six year old daughter of Acclamation had previously won twice for trainer John Murphy and today followed up a recent debut success for Joseph O'Brien at Roscommon, as she beat Invincible Queen at the Co Kilkenny venue. Winning trainer Joseph O’Brien later said “she won nicely the last day and they went a good gallop today. Donnacha said he was confident enough down the straight that he was going to get there. Donnacha O'Brien steered Pink Dogwood and Circus Maximus to earlier wins on the card and while Best Not Argue was his 99th winner this season, she could have been his 100th,, as the jockey earlier passed-over winner Broadway in favour of loser Ship Of Dreams in the Group 3 feature. Those lucky enough to have put the four of them together were rewarded at odds of 659/1 as Joseph O'Brien's final runner of the night at Galway, Cascabel (6/4 favourite) brought up a four-timer for the yard in the Sean Cleary Memorial Fillies Maiden. Niall McCullagh on Baby Pink and Shane Crosse on Elleanthus and Song Of The Sky did the needful earlier for the Carriganog Racing team. O'Brien's brother Donnacha was entrusted with the spin on Cascabel, and the championship leader book-ended the card himself having landed the opener on his father Aidan's Sovereign. Cascabel's attitude was exemplary, as in tough conditions she just wasn't to be denied, eventually accounting for Endless Tangent and Bridge Native by a head and half a length. There was a length and three quarters then to Chateau La Fleur (7/2 into 9/4) in fourth. "It's nice to get a win into her as she is well bred and has been banging on the door the last two times. She was probably a bit unlucky here in Galway two runs ago and today when I got stuck into her she found a bit," said Donnacha O'Brien. Race six at Galway saw Joseph O'Brien make it three on the evening at odds of 263/1 as jockey Shane Crosse brought up a brace aboard Song Of The Sky in the Galway Apprentice Handicap. Baby Pink (Niall McCullagh in the feature) and Ellenathus (Shane Crosse) were the previous Carriganog Racing victors as the young Tipperary apprentice completed his first double. Here he got Song Of The Sky home by three parts of a length from Faughill. "We went a good honest pace the whole way and I let her find her feet out the back. When she came down the hill there was nothing stopping her and she made up a heap of ground for me," said Crosse. "She's as genuine as they come and that's my first double. I'm 16 and that's 16 wins in total." His father and brother Aidan and Donnacha set the ball rolling on Galway's card this evening with a win for Sovereign. Joseph O'Brien is again the headline maker though, with a 65/1 double, brought up by Elleanthus (5/1) in the Irish Stallion Farms EBF Median Auction Fillies Maiden. Niall McCullagh won the feature on Carriganog Racing's Baby Pink, but it was young Shane Crosse that took the reins on Elleanthus (backed in from 8s to his staring price). Owned and bred by O'Brien’s parents, Aidan and Annmarie, Elleanthus led home 50/1 shot Ulookinatmeboy by four and a quarter lengths. For good measure Joseph O'Brien also had the third home, Syrena (11/4). 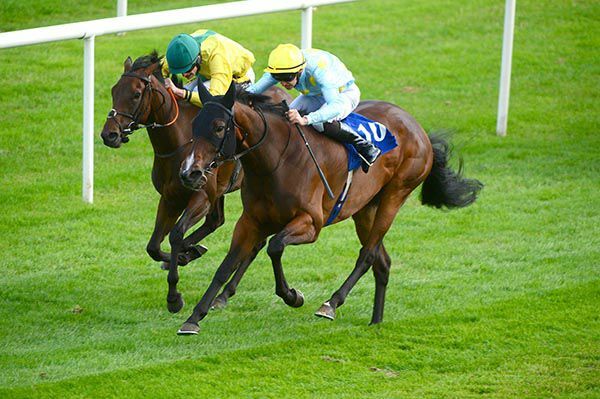 "She was sixth in a hot maiden at the Curragh on her debut and travelled well in today's race and picked up well when I gave her a squeeze," said Crosse. 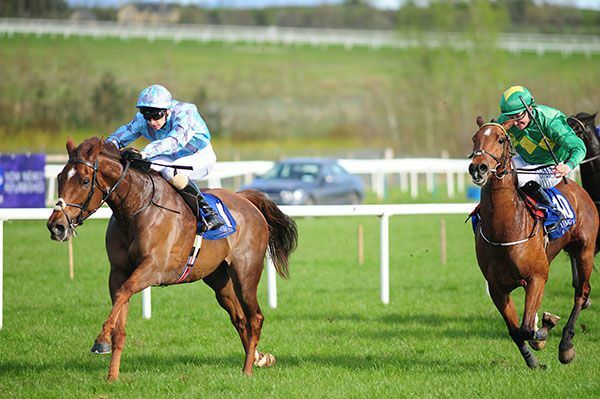 Progressive three-year-old Baby Pink (10/1) shed her maiden tag at Listowel last week and she took it to another level when following up today in the Listed Ardilaun Hotel Oyster Stakes at Galway. She obviously copes very well with testing conditions and under Niall McCullagh that helped in her getting the better of favourite Princess Yaiza, by half a length, after a tremendous scrap up the straight. Baby Pink was one of no less than four runners in here for Joseph O'Brien. His father Aidan had three in the mix, whilst the Coolmore partners own Alwaysandforever, brought across by Luca Cumani. However the best any of these could manage was fifth (High Language took that spot for Joseph) as Morga ran on well for third, a length and a half off the principals. Said McCullagh, after riding his first winner for Joseph O'Brien: "I've ridden a couple of times in those colours for Joe's (O'Brien, winning trainer) dad Aidan so it was great when Ciaran (O'Toole, agent) said he had a spare in the Listed race and I saw it had won on heavy ground at Listowel. When you go on the ground you always have a chance. "Joseph said to jump out and try to get her away - sometimes she can be sluggish, but if you're in the first three or four ride her handy and ride a normal race. 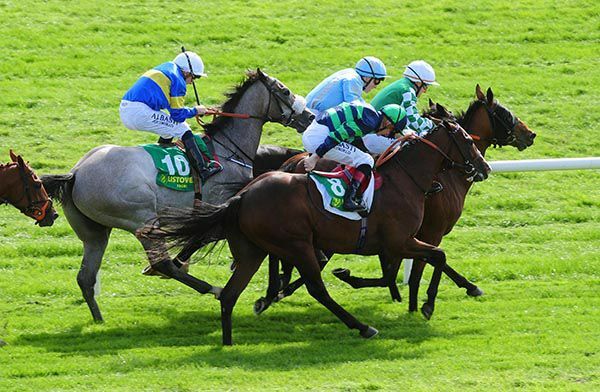 "In fairness she ground it out very well and got to the line good. It's great to get black-type for her and to win is absolutely fantastic." 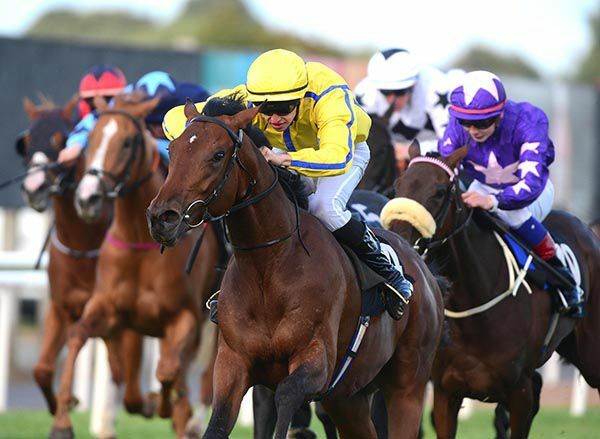 The squeeze for precious spots at the Werribee quarantine centre is beginning to take a toll with the weekend's Irish St Leger runner-up Latrobe a likely spring carnival casualty. Latrobe, who finished second to Aidan O'Brien's Flag Of Honour in the Irish classic on Sunday, is already assured of a Melbourne Cup run - being seventh in order for a start due to his Irish Derby win in June - but his part-owner Lloyd Williams said on Monday that he will only make the journey to Melbourne if his travelling partner Master Of Reality goes with him. Master Of Reality is 152nd in order for a Melbourne Cup run and is being aimed at gaining an 11th-hour berth through the Lexus Stakes three days before the Cup, but such is the rush for spots in quarantine at Werribee, he may be excluded from the facility due to his relatively low international rating of 102. Such are the numbers of northern hemisphere horses bound for Melbourne's riches this spring, Racing Victoria will be forced to give preference to the highest-rated gallopers and so Master Of Reality is likely to get bumped to the government quarantine facility north of Melbourne at Mickleham. Unlike Werribee, which offers state-of-the-art training facilities at the Werribee racecourse, horses cannot be worked from the Mickleham centre during their mandatory two-week stay and so will be unable to race this spring. Racing Victoria's general manger of racing operations Paul Bloodworth confirmed the squeeze was on for that final shipment of Cup contenders. "We've just got eight spots available in the second shipment," Bloodworth explained. "Three stables have signalled their intention to come and that's the stables of Torcedor, Marmelo and Magic Circle. "Torcedor is rated 119, Magic Circle is 116 and Marmelo 114 so we've basically got five sports left available. "I'm not sure of what Willie Mullins wants to do, but I'd think he'd send one or both of Thomas Hobson and Max Dynamite and they are both rated above Master Of Reality before Friday night when they ran first and second in the Doncaster Cup. "I am not sure as to what Aidan's (O'Brien) doing either. He's got Kew Gardens and now Flag Of Honour and another horse who won on the weekend in Rostropovich (19th in order). "All those horses are rated above Master Of Reality and there are a couple of other horses potentially in the mix that are rated above him. "We just can’t have a situation where Master Of Reality keeps a higher-rated Melbourne Cup horse out. "If it came down to it that we only had seven horses, then, sure, we could accommodate Master Of Reality. "But, assuming Aidan wants to bring at least a couple and assuming that Willie wants to bring one or two, it is looking difficult for the travelling companion to come." Latrobe is trained by O'Brien's son Joseph, who broke new ground last spring when the youngest trainer - at 24 - to win Australia's greatest race with Rekindling. Williams, a record-breaking six-time winner of the Melbourne Cup, said it would be "very sad" if Latrobe misses a trip to Melbourne claiming the horse probably needed the run in the St Leger as he was coming off a single 2000-metre start in the International Stakes at York since his derby success. 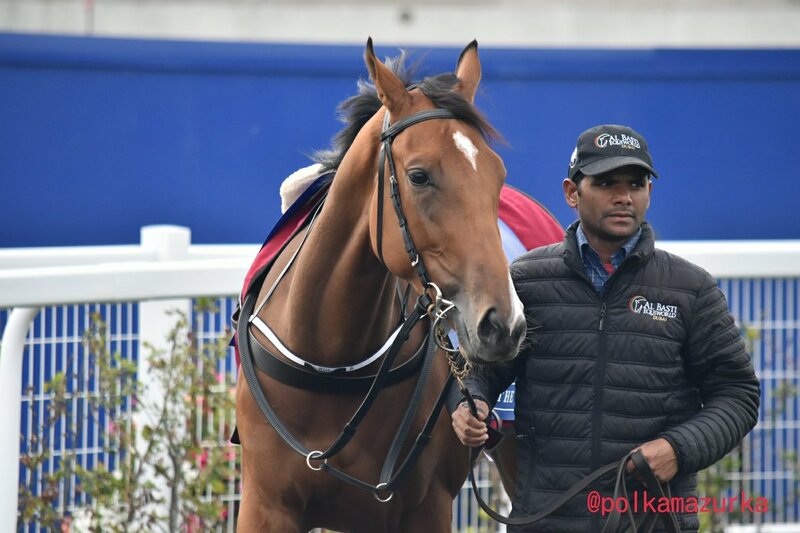 The Irish St Leger win of Flag Of Honour was the second classic over the weekend for O'Brien as he's won the English version a day earlier with Kew Gardens. 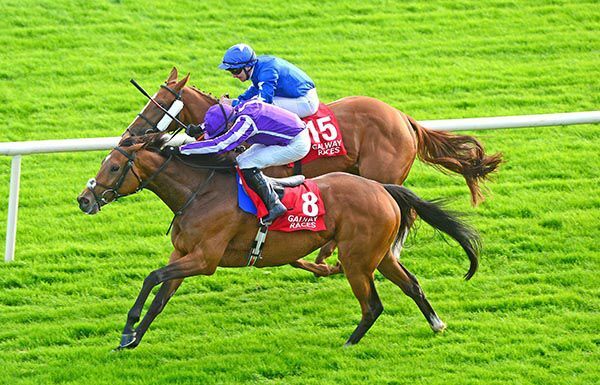 Both St Leger winners hold a Melbourne Cup entry with Kew Gardens third in line for a start and Flag Of Honour 25th. Both gallopers firmed into $17 for the race in most markets. The Melbourne Cup picture will get a lot clearer on September 27 when those northern hemisphere Cup horses must enter quarantine to begin their two weeks at home before the flight to Melbourne. First declarations for the race are taken on October 9. Triplicate continued the red-hot form of the Joseph O’Brien yard when taking the Gas Networks Ireland Novice Hurdle to complete a quick double for the Piltown trainer at Listowel. Petit Tartare recorded a 16/1 surprise in the opening maiden hurdle but Triplicate carried a lot more confidence in this two-mile event. Mark Walsh’s mount, available at 9/2 this morning and sent off at 11/4, struck the front after the pace-setting Aramon made a slight mistake at the second last. The J P McManus-owned gelding kept on well on the run-in to beat the 5/4 favourite Aramon by a length and a quarter. Eglantine Du Seuil held every chance early in the straight but could only keep on at one pace a further two lengths away in third. 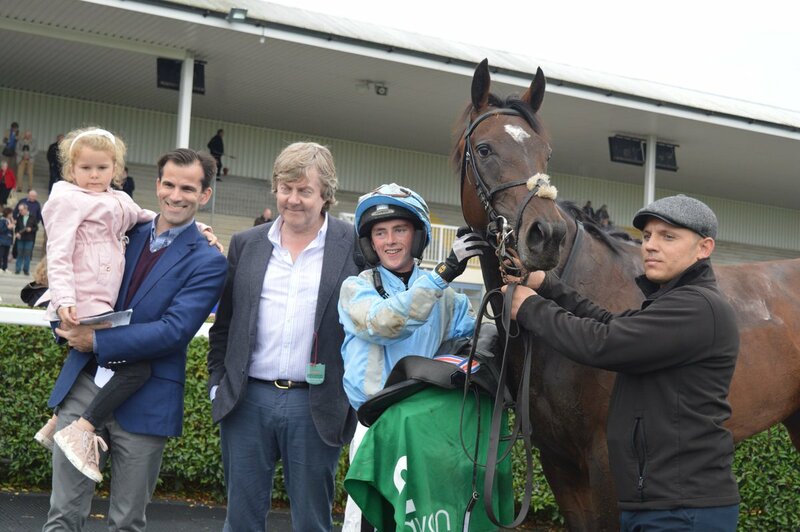 McManus' racing manager Frank Berry said, "He enjoys the jumping and he handled the ground well. You couldn't have asked for more and he is going the right way. "He is learning and where he'll get to I don't know. 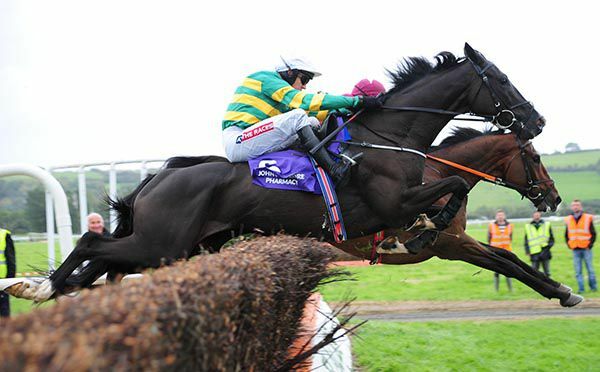 The Grade 3 Joe Mac Novice Hurdle at Tipperary next month would be ideal for him next." Petit Tartare caused a surprise when supplying Joseph O’Brien with his eighth winner of the week at the Listowel Festival in the John Lynch Memorial Maiden Hurdle. The Heliostatic gelding was sent off a 16/1 chance as punters concentrated on Balliniska Band after Panther Soul (passport irregularity) was an absentee. Randalls Ur Poet set the pace in this two-mile event but relinquished the lead to the 4/7 favourite when wandering about on the run to the penultimate flight. However Shane Shortall was all the time making good progress up the stands’ side aboard Petit Tartare, and kept on strongly on the run-in to get the better of Balliniska Band by half a length. Shortall said, "He was a bit disappointing in his bumper and we felt he was a bit light so gave him a break and he looked a lot better today. "It was a fact-finding mission today to see how he would take to it and he took to it very well. I felt I had them covered going to the second last but he made a mistake and I gathered him up and stayed at his job very well. "He has put a couple of nice ones behind him and for a first-time out performance like that you'd be hopeful with him." Joseph and Donnacha O'Brien doubled their score at Listowel when Baby Pink landed the John & Terry Moriarty Memorial Handicap by no less than eight and a half lengths. The 8/1 shot relegated Willie Mullins' Maze Runner to the silver medal position but of course he'd just had the 1-2 in the Doncaster Cup with Thomas Hobson and Max Dynamite. Earlier on the mark aboard Rattling Jewel, Donnacha O'Brien said: "She broke slow and didn't really travel for the first half. "I brought her wide and sent her on early and in fairness to her she quickened up well." The Curragh to Listowel it seemingly all comes alike to Rattling Jewel (5/1 favourite) as he showed when stylishly capturing the Guinness Handicap at the penultimate stage of the harvest festival. Three times a winner at headquarters, here the Joseph O'Brien-trained and Donnacha O'Brien-ridden six-year-old had six and a half lengths to spare over Ecoeye after taking over from before the two pole. Owner John O'Mahony sourced the Royal Applause gelding from the Baldings cross-channel initially, and he triumphed three times under his purple and white silks when with Nicole McKenna. "He deserved that and tries hard and I'm having a good week, so it's nice to get another one on the board," said Donnacha O'Brien. "He is a grand old horse and is a dream to ride, loves that ground and six or seven furlongs is his trip." The Joseph O'Brien-trained Arcturus proved brave to squeeze up the rail and gain the day in the opening Irish Stallion Farms EBF Median Auction Maiden at Listowel. Shane Crosse had to bide his time on the 3/1 shot and made progress on the fence a furlong-and-a-half from home. He challenged on the inner just inside the final furlong and got his head narrowly in front passing the 100 yards marker. The son of Fast Company stuck on well in the closing stages to hold 9/4 favourite Sacchoandvanzetti by half a length. There was an enquiry with Zeb Spirit getting squeezed up inside the final furlong but the result was unaffected. Arcturus had finished fifth on his debut at Roscommon five days ago. “Once I turned for home I saw a bit of daylight up the rail, and when he took it I always thought he was going to get there. He was nice and tough." 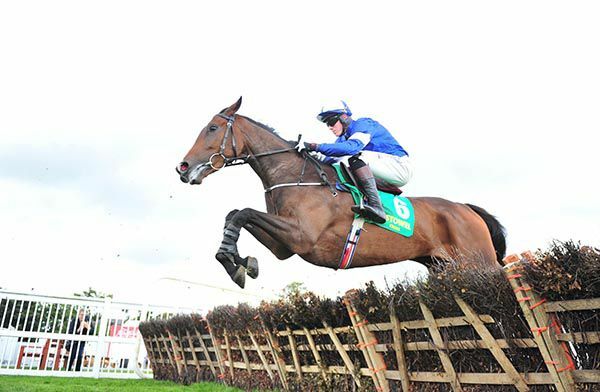 Nick Peacock (Wicklow Bloodstock Ltd), Willie Mullins and Paul Townend were relegated to the runner-up spot for the second race in succession when Air Supremacy landed the Ballygarry House Hotel Novice Hurdle at Listowel. Their Saturnas just lost out to Snow Falcon in the Kerry National thirty five minutes earlier, and here under the predominantly purple silks Easy Game found Air Supremacy a length his superior. It would likely have been a different story though if leader Getareason hadn't made a bad mistake at the last. He was also representing Willie Mullins and ended up a length and a quarter back in third position in the hands of David Mullins. Air Supremacy represents J P McManus, and Mark Walsh rode the Joseph O'Brien-trained youngster. McManus' racing manager Frank Berry said: "He's battled away well but I suppose the other horse making a mistake has changed it around. He jumped much better than he did in Killarney and he's progressing. "We'll find another little one for him and take it from there. We wondered about the ground but he handled it, and probably would go on a bit softer and looser." Le Richebourg completed a treble at Listowel for Joseph O'Brien and JP McManus, as he comfortably took the John F McGuire Beginners Chase on his debut over fences. Second in a Grade 1 at Leopardstown over Christmas, the son of Network was fifteenth of twenty-four in the County Hurdle at Cheltenham in March. Last seen finishing a fine fifth in the Galway Hurdle behind Sharjah, the bay five-year-old was expected to deliver today, going off the 4/5 favourite under Barry Geraghty. In third early on, he improved a place into second with a circuit to race, and closed on the front-running Arvico Bleu approaching the straight. He was shaken-up from the second last, and got to the front after the final fence, going on to score comfortably by a length and three parts. Frank Berry, racing manager to JP McManus, said: "He jumped great and handled the ground. You couldn't ask for better and it was nice. He ran a blinder in the Galway Hurdle when the ground went a bit on him during the day. 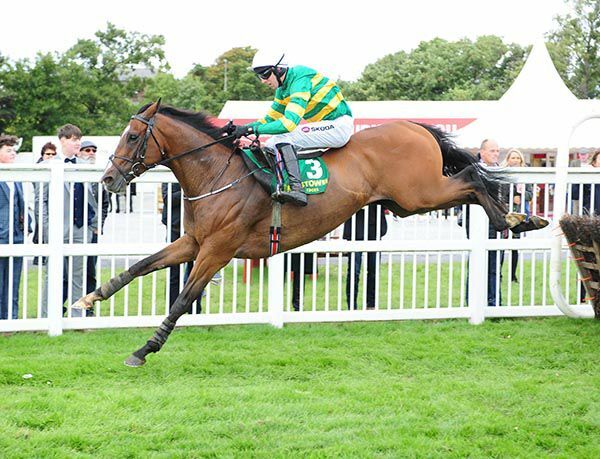 "We thought he might have went a bit higher over hurdles but in fairness he didn't run badly in the Galway Hurdle but hopefully he will (make a better chaser than hurdler); he'd need to, to be in the top division. "He likes the jumping which is a big thing, and you could only be pleased with him and we'll find a novice down the road with him." O'Brien and McManus earlier combined with Gold Seal, while they took the first two races separately, with Bay Hill (trained by Padraig Roche and owned by McManus) and Beautiful Citi respectively. Gold Seal was awarded the feature at Listowel this afternoon, the Grade B Liam Healy Memorial Lartigue Hurdle, completing a double on the card for Joseph O'Brien. The 5/1 favourite Kuiper Belt finished was first passed the post under Denis O'Regan for Gordon Elliott, but he veered across in front of Gold Seal approaching the second last, causing interference. Gold Seal then threw down a strong challenge on the run-in, but just failed to peg back Kuiper Belt, with a short head between them at the line. 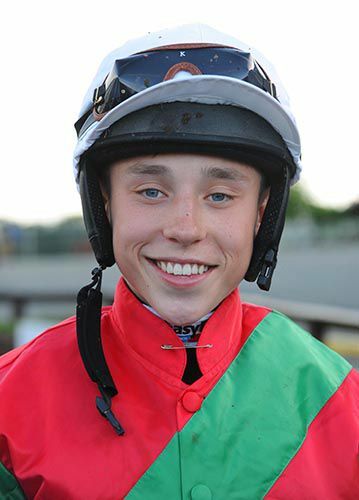 Evan Daly was aboard the JP McManus owned victor (also successful with Bay Hill in the opener), who was returned at 11/1 (16s in early shows) in first time cheekpieces. The front pair were a length and a half in front of Randalls Ur Poet who finished third under Mark Bolger for Seamus Fahey at 8/1. A bad mistake two out from the 8/15 favourite Diamond Hill, gifted the Jet O'Carroll Memorial Irish EBF Mares Maiden Hurdle to Beautiful Citi. Travelling strongly in front, the Willie Mullins trained market leader crumpled on landing at the penultimate obstacle, and quickly dropped to fourth. The Joseph O'Brien trained Beautiful Citi (9/4), who was being pushed along in second at the time, was then left in front, and she soon went clear, going on to score easily by nine lengths under Davy Russell. Duchess Ravenwaves ran a fine race to take second at 25/1 under David Mullins for Andy Oliver, while the front-running Indian Music (12/1) was another two and three parts of a length back in third. Diamond Hill was a further length and a half away in fourth. Russell said afterwards: "On form it was down to the two of us, and obviously Paul (Townend on Diamond Hill) looked a bit unlucky." Owner/breeder Sean O'Driscoll added: "It's a great day. It's not often a Cork man gets to take a trophy out of Kerry so I'm absolutely delighted. "She ran in the Cork colours and had a Cork man on her back so what more could we want. We got one up on Kerry for a change. "She's a lovely, lovely mare. I bred her myself and have a three-year-old full-brother to her. He just went into training with Joseph last week. He is a fine horse as well and we are looking forward to him next year. "She has never disappointed us, she has a great attitude and has it all. Hopefully if she stays sound we will have an exciting future with her. 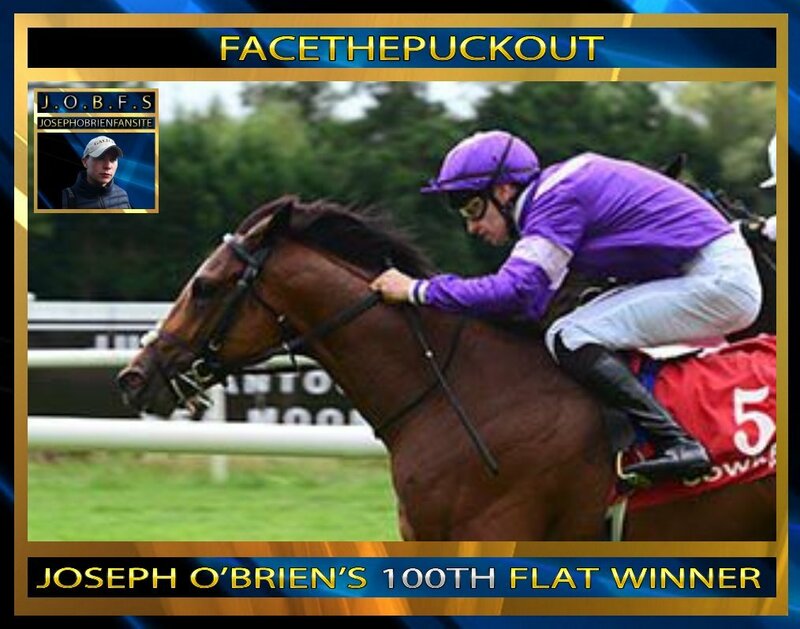 "Joseph O'Brien is just a genius. He has the bloodlines, he is just an extraordinary fine young man and a wonderful trainer. It's a pleasure to have horses with him." "He's in good form. We probably got our tactics wrong a bit at York but obviously we also found out that we needed to go back up in trip. It was a bit of a fact-finding mission at York as we had the easier option of running him in the Great Voltigeur under a penalty. But I suppose it made more sense for us to find out exactly where we are with him. We had to rule it out or in. "He didn't run too badly at all and we were probably a bit too positive in a race where you wanted to be sitting a bit further back. He was a bit outpaced and he stayed on well but after that we said we would go straight back up in trip. He's a grand big horse, uncomplicated and he should be better next year. He only had one start at two and he progressed a lot over the winter. Because he's a big horse he's still relatively lightly raced. 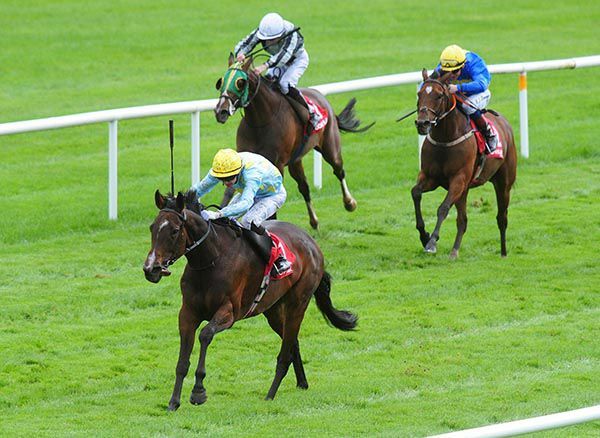 "It's a hugely competitive race but he is an Irish Derby winner and entitled to take his place. He should get the trip and we'll see what happens. His sire Camelot was second in the race but he's out of a quick mare and his sister is best at seven furlongs. It wouldn't be guaranteed he will stay but you'd have to be quite hopeful. I always thought he was relatively versatile with conditions but his best form has been on quick ground. But then he was only beaten a short head on soft ground so I would say he is versatile and the weather forecast whichever way wouldn't be a concern." 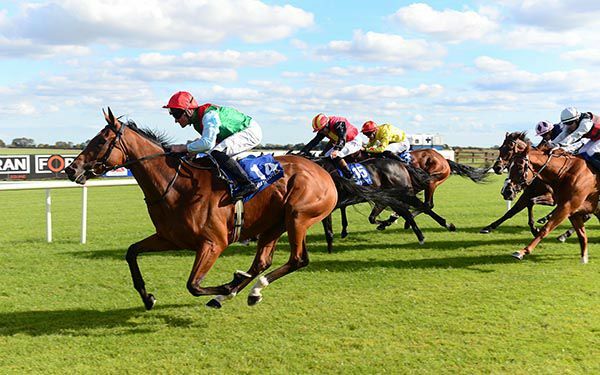 The Gormanlough Apprentice Handicap at Navan produced another thrilling finish with Aibell just getting the verdict in the ten furlong contest. Alan Persse produced his mount with a strong run on the outer to challenged inside the final furlong. Joseph O'Brien's charge, sent off a 12/1 shot, was locked together with Wavepoint close home and there was only a nose separating the pair at the line. Persse was unseated after the line and explained:- “The loose horse jumped a bit of rail and she just jinked. “She did it well in the end. It was her first time up at that trip and Joseph just wanted me to take my time and get her to stay out the trip. She stayed going the whole way to the line like she'd want a bit further. Brothers Joseph O'Brien, trainer, and Donnacha O'Brien, jockey, combined to win the JC Halliday & Sons Nursery Handicap at Down Royal today as the pair scored with easy winner and handicap debutante Colfer Me. The son of Canford Cliffs had finished unplaced in his three maiden attempts but today quickened nicely to provide Jockeys' Championship clear leader Donnacha O'Brien with his 86th winner of the season, 20 ahead of nearest pursuer Colin Keane. Trainer Joseph O'Brien wasn't present but winning owner Vincent Kelly, from Co Kildare, later said "I'm very, very happy with that! We were very confident coming up today, the distance and all suited him grand. I would be thinking definitely a mile (next year). "Joseph (O'Brien) was very optimistic and we are hoping we might run him in Listowel on Monday once we see what way he gets home. "He's a horse I bred and hopefully there is more to come. "It was a good two and a half hour run up and we'll have a good spin going back!" Ming is another exciting horse at O’Brien’s disposal. He could head to @WoodbineTB, Canada, for the Northern Dancer Stakes next. A tilt at the Caulfield or Melbourne Cup is also a possible target for the three-year-old son of Pour Moi. O’Brien could have his first runner in the £325,200 G1 @32Red Sprint Cup @haydockraces on Saturday with Speak In Colours, who captured the G3 Phoenix Sprint Stakes at the Curragh last time out. Joseph O’Brien is hopeful that Latrobe will see out the trip in the William Hill St Leger at Doncaster on Saturday week. 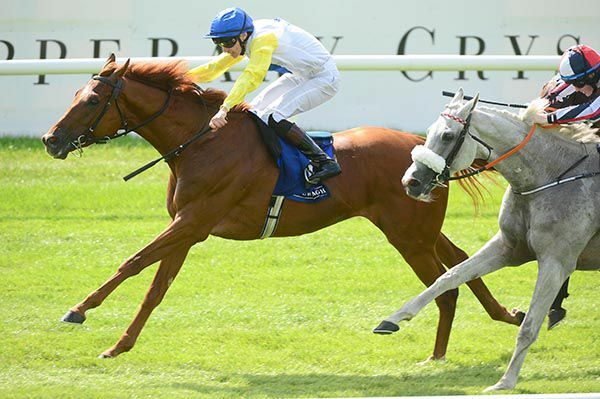 The Irish Derby winner dropped down to 10 furlongs for a competitive Juddmonte International at York but failed to cut any ice. O’Brien had been contemplating taking on Winx in Australia but those plans were subsequently shelved after his eclipse on the Knavesmire. “It was a mile and a quarter last time and he had options in Australia later in the year. We were not sure if he’s a horse who wanted 12 furlongs or whether he’d be better going back to 10. It was kind of a fact-finding mission,” said O’Brien. “Obviously he had the easier option of going for the Voltigeur with a penalty but he didn’t run too badly in the Juddmonte and he probably was a bit positive in a race where you wanted to be settled a bit further back. Of the dangers O’Brien said: “I suppose Kew Gardens had a great run in France and ran very well in the Voltigeur so he’s kind of the obvious one but the British team are always strong and I don’t think this year is any different. “Obviously it’s a highly-competitive race but he’s an Irish Derby winner and he’s entitled to be in the line-up. O’Brien won the Melbourne Cup with Rekindling last year yet despite Latrobe being in the same Australian ownership, Latrobe is not certain to go. “It’s a big ask for a three-year-old colt to go to Melbourne and it’s not a decision we’ll take lightly. 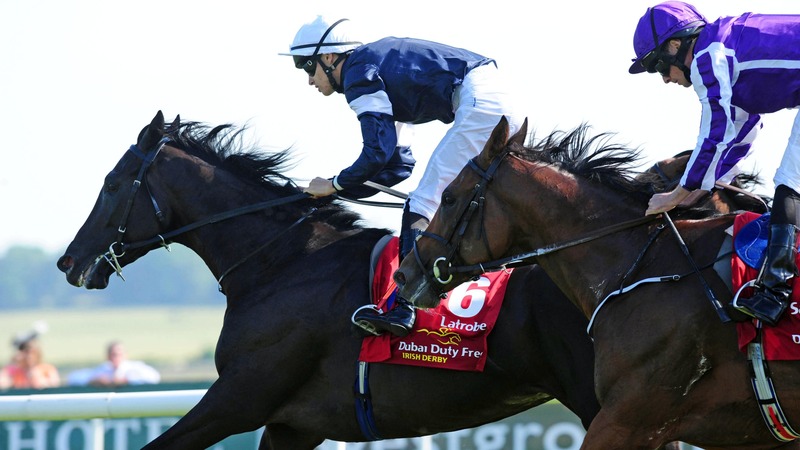 Unless we’re very happy with him and he runs well in the Leger he might go but it is far from set in stone,” said O’Brien. Unconsidered outsider Flicker Flame stormed home in the Roscommon Apprentice Maiden to give trainer Joseph O'Brien an almost 500-1 treble on the card at the Connacht track. The 25-1 shot delivered her challenge for Alan Persse a furlong and a half out and drew three and three quarter lengths clear at the line. Epaneema (9/2) finished second with Leaderboard a further three parts of a length back in third at 7/2. O'Brien also supplied the 7/4 favourite, High Mounte, who weakened to fifth after being headed a furlong and a half from home. His other two winners on the card were Cosmic Horizon (7/4f) and Best Not Argue at 6/1.The treble paid 499.5/1. 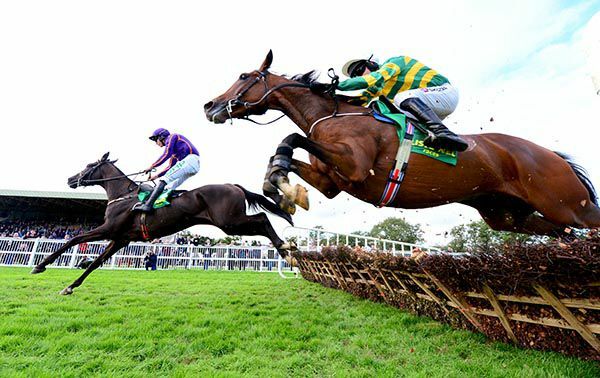 Brothers Joseph and Donnacha O'Brien were in double-winning form at Roscommon as Best Not Argue delivered in division one of the Alice Farrell Memorial Handicap. The six-year-old mare was having her first start for Joseph O'Brien and was coming off a break of 324 days. She was last approaching the straight and came wide before making headway at the two pole. You couldn't have called her the winner a furlong out when she was fifth but she was soon ridden by Donnacha O'Brien and thundered home to get up in the closing stages by half a length. O'Brien put up 2lb overweight on the mare who sported a first-time hood. Piper Bomb had to settle for second at 7/1, with Bittern Cry five lengths adrift in third at 11/1. Jockey O'Brien said: "She is not a filly I know a whole lot about but she has done that nicely today. "She is fairly versatile (ground-wise) and it's not that slow out there, it's good ground. "It's her first run for Joseph and it's nice to get a win into her and hopefully she can win again." Best Not Argue won two races for her former trainer John Murphy. Cosmic Horizon was a ready winner of the Irish Stallion Farms EBF Median Auction Race in Roscommon. 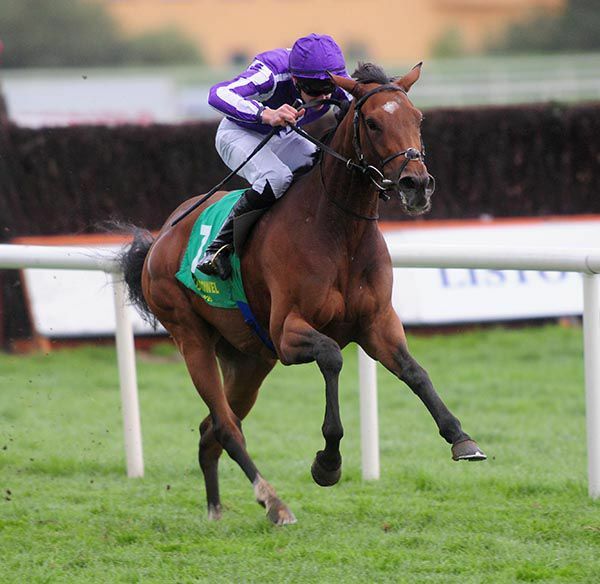 Joseph O'Brien's colt, who is owned by Irish Rugby coach Joe Schmidt, got off the mark on the third attempt. The 7/4 favourite tracked Copia Verborum before assuming the lead with less than a quarter of a mile to race. He was ridden to assert passing the furlong marker and maintained the gallop to score by two and a quarter lengths. Dark Conqueror took the runner-up berth at 3/1, the same distance ahead of Copia Verborum (9/2). 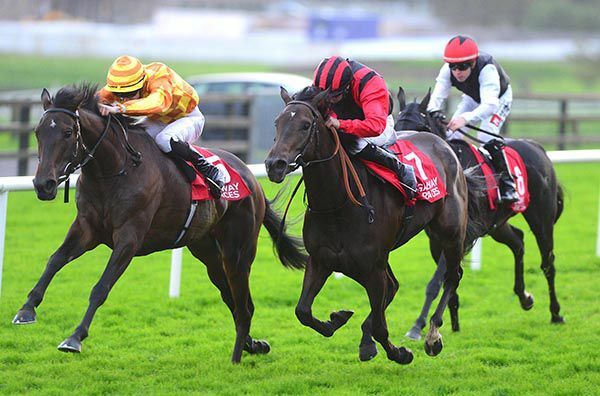 Jockey Donnacha O'Brien said: "It was a good performance and it wasn't a bad race. He was unlucky at Galway the last day and it's nice to get a win into him. 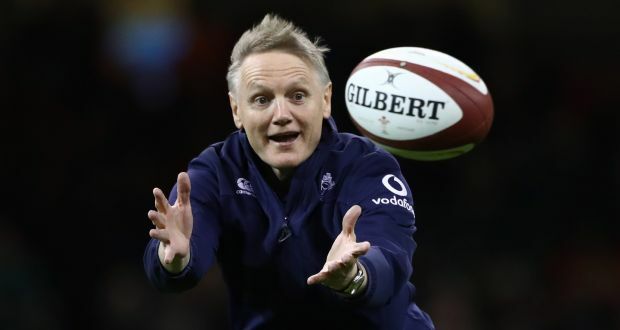 "Joe (Schmidt) was in Galway the last day but isn't here today. Joe is good friends of ours and it's nice to get a winner for him. I think he has an interest - Joseph (O'Brien) would tell you more but you'd never know he could get another horse and I think he enjoys going racing." The first of Donnacha O’Brien’s five rides at Roscommon on Monday evening will be when he dons the colours of Irish rugby’s head coach Joe Schmidt in the opener. Schmidt is a long-time racing fan but Cosmic Horizon is his first venture into ownership. 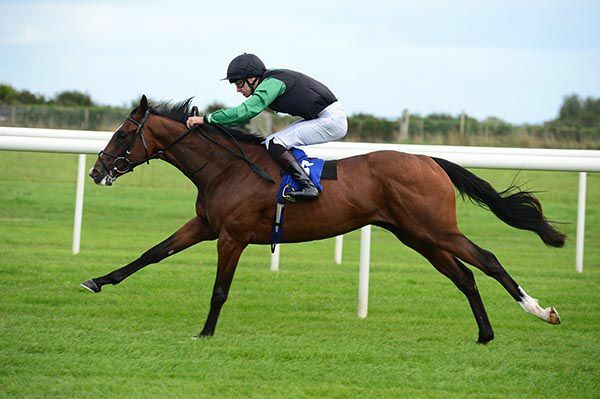 The juvenile colt was narrowly beaten at the Galway festival by Zuenoon - a winner again since - and Cosmic Horizon gets a useful 4lbs from the two previous winners in Monday’s race. Cosmic Horizon is certainly ridden by the most in-form jockey in the country as O’Brien’s Curragh four-timer on Saturday looks to have given him a firm grip on a first riders championship. O’Brien is now on 81 winners for the season, 17 ahead of the reigning champion, Colin Keane. Aidan O’Brien passed the century mark for winners in Ireland this season when his own Saturday four-timer took him to 102. His son Joseph is next in the trainer’s table with 56. 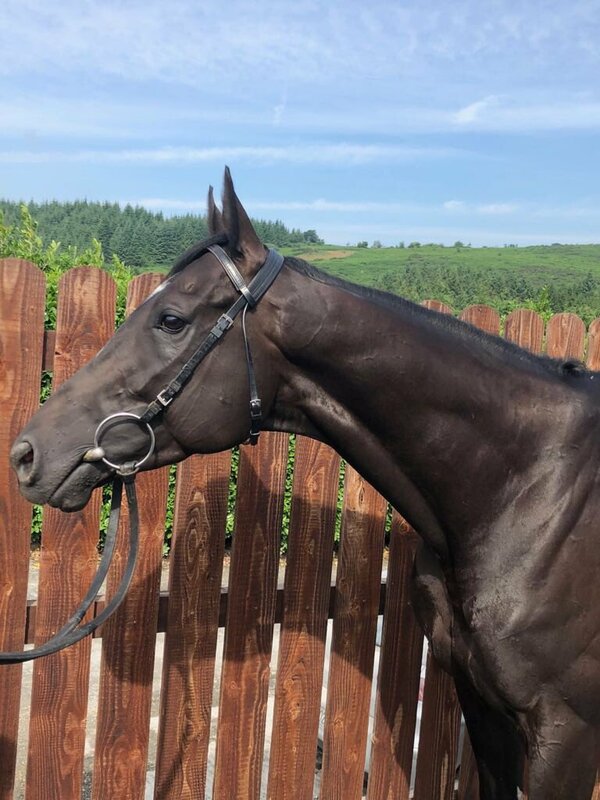 In addition to Cosmic Horizon Donnacha O’Brien has three other rides for his brother on Monday as well as Erin for his father in a fillies handicap. 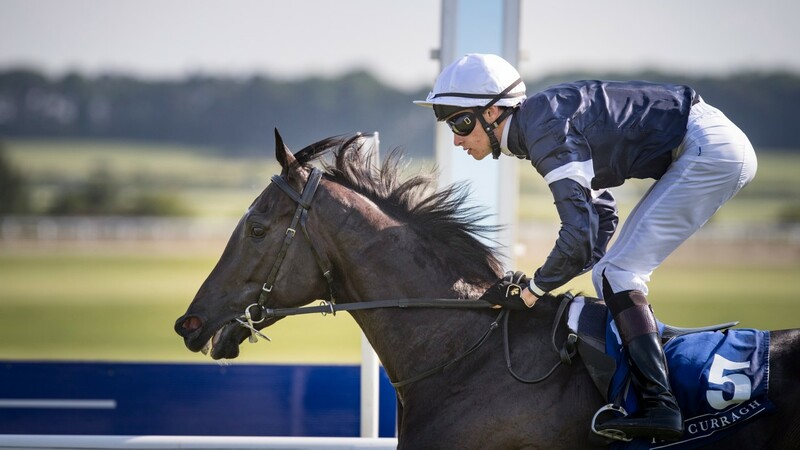 Donnacha O'Brien partnered his 80th winner of the season at the Curragh today as the Jockeys' Championship clear leader completed a treble on the day on his brother Joseph O'Brien's Perfect Tapatino (7/4f) in the John Sisk & Son Handicap. Jockey O'Brien was earlier successful in the opening races with Sydney Opera House and Just Wonderful, both trained by his father Aidan O'Brien and completed his hat-trick on the son of Perfect Soul, which won under a nicely timed challenge coming from off the pace, beating Vastonea by three parts of a length. Trainer Joseph O'Brien later commented “he had a good run, on his first run for us, in Leopardstown and then he was supposed to run in Ballinrobe and it was called off, so we came here as it was the obvious next step for him. “He looked at Leopardstown that he'd win off his mark; it was a mile there and looked a bit short for him. 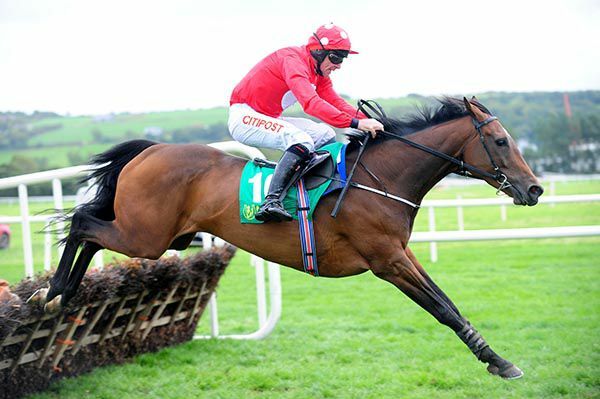 “Donnacha said he thinks he'll get a mile-and-a-half and he's a fantastically well-bred horse. It my first winner for Charles Fipke so it's great, it's only the second horse we've had, and we're delighted to get a winner for him. Donnacha O'Brien now leads current Champion Colin Keane 80-64 at the head of this season's Jockey's Championship.